In the vein of Big Little Lies and Reconstructing Amelia comes an emotionally charged domestic suspense novel about a mother unraveling the truth behind how her daughter became brain dead. And pregnant. A search for the truth. A lifetime of lies. In the small hours of the morning, Abi Knight is startled awake by the phone call no mother ever wants to get: her teenage daughter Olivia has fallen off a bridge. Not only is Olivia brain dead, she’s pregnant and must remain on life support to keep her baby alive. And then Abi sees the angry bruises circling Olivia’s wrists. When the police unexpectedly rule Olivia’s fall an accident, Abi decides to find out what really happened that night. Heartbroken and grieving, she unravels the threads of her daughter’s life. 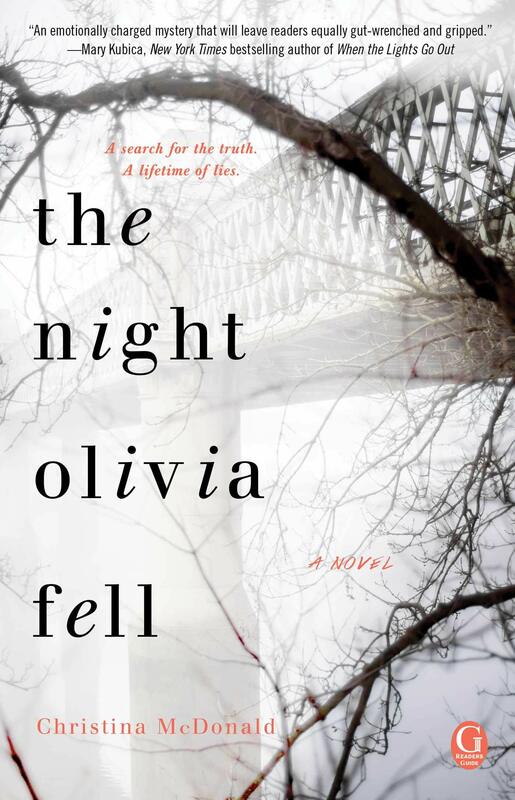 Was Olivia’s fall an accident? Or something far more sinister? I woke up abruptly, dreams tumbling from me in cottony wisps. You have no idea how good it feels to finally have finished a book again. I am so happy and proud of myself. Over the last few months I haven’t really been reading a lot but this book, The Night Olivia Fell by Christina McDonald, made me not able to stop reading very quickly. It took me longer to finish it compared to when I finished books in a couple of days a few years ago, but still, I am happy that I was able to do it under a month haha. Enough talking about my bad reading habits. Let’s jump into Olivia’s and Abi’s story. You know that I am not a big thriller lover. In fact, I haven’t read any crime or thriller in such a long time and was a bit surprised by myself that I picked up this book. Honestly, I think it tells a lot about the book if me, an absolute romance addict, was convinced to finish it. The book starts with Abi, Olivia’s mom, waking up in the middle of the night to her phone ringing. It’s the hospital telling her that they found Olivia under a bridge, brain dead and pregnant. No-one knows what really happened and they all think it was an accident except Abi. She knows her daughter and that she would never jump off a bridge. She wants to know the truth about what happened that night and why and who the father is to Olivia’s baby. From the beginning on Abi seemed like a great mom. She was absolutely devastated when she heard about what happened to Olivia and did everything in her power to solve the case. Over the course of the story, it became clear that she already went through some very traumatic times in her past and that they definitely left a scar on her. Caring and looking after Olivia has become her only true purpose in life and now that she is gone, she doesn’t know what else to do than finding out what happened to her daughter to at least get some peace. I loved that with every chapter of the book you didn’t only get to know Abi’s side of the story but also Olivia’s. She often felt locked up in the strict rules of her mom to keep her safe. Like every teenager, Olivia wants to meet boys and break rules which makes her lie to her mom. She finds out very hidden secrets about her family which connect the stories of Abi and Olivia and make them one. I loved that so much. The writing style is great and the shorter chapters make the book an easy and fast read. You will find yourself reading one chapter after the other and even though it isn’t really scary, it is so thrilling and you won’t be able to stop reading. So, of course, the only thing I can do is recommend you reading this book. If you like thrillers and suspense, this one is definitely for you. And if you don’t like it, then read it anyways. Try new genres, you will be surprised how good and fresh something different can feel. At least that was what The Nigh Olivia Fell left me feeling. Find all the details about The Night Olivia Fell on Goodreads and Amazon. Anzeige | Tell me what you are reading at the moment 📚 . I am trying to finish up ‘The Bullet Journal Method’ and ‘Becoming Michelle Obama’ which I both love SO much ✨ . Also, if you have any NA book recommendations, please, send them my way 😻 love that genre at the moment!! Do you ever feel like you wanna hop back into a book? . I finished the second book of a german romance novel two days ago and all I can think about are the characters and the whole book in general. I felt and still feel like I was part of the whole story and want to jump right back into it 🙈 . On a brighter side, Uni starts tomorrow and since the book’s characters went to Uni I feel really motivated to go back and hopefully have a better semester than last one (another weird thing books can make you do/feel) ✨ . But the lovely weather will already make such a difference, I am sure of that ☀️ and I am very excited to see my friends again! You gotta motivate yourself, am I right? Happy Easter 💫 Hope you are having a sunny, relaxing day with all your loved ones around you ♥️ My mama gave me a basket full of Kinder chocolates...I am in absolute heaven ✨ . What is your favorite kind of chocolate? I sorted out my books today which felt SO good! All I am keeping is way too big tbr and all books which are dear to my heart 📚 A reorganized bookshelf is so refreshing...now the only challenge is to not fill it up again 🌚 . Do you go through your bookshelves and sort out books on a regular basis? Or just occasionally?